"Now please hear about Lord Jagannatha's going to the Gundica temple while Sri Caitanya Mahaprabhu danced before the Ratha car. The Lord performed kirtana for some time and, through His own endeavor, inspired all the devotees to dance. When the Lord Himself wanted to dance, all seven groups combined together. The Lord's devotees--including Srivasa, Ramai, Raghu, Govinda, Mukunda, Haridasa, Govindananda, Madhava and Govinda--all combined together. When Sri Caitanya Mahaprabhu desired to jump high while dancing, He placed these nine people in the charge of Svarupa Damodara. These devotees [Svarupa Damodara and the devotees in his charge] sang along with the Lord, and they also ran beside Him. All the other groups of men also sang. 'I am not a brahmana, I am not a ksatriya, I am not a vaisya or a sudra. Nor am I a brahmacari, a householder, a vanaprastha or a sannyasi. I identify Myself only as the servant of the servant of the servant of the lotus feet of Lord Sri Krsna, the maintainer of the gopis. He is like an ocean of nectar, and He is the cause of universal transcendental bliss. He is always existing with brilliance.' "
Having recited all these verses from scripture, the Lord again offered His obeisances, and all the devotees, with folded hands, also offered prayers to the Supreme Personality of Godhead. When Sri Caitanya Mahaprabhu danced and jumped high, roaring like thunder and moving in a circle like a wheel, He appeared like a circling firebrand. Wherever Sri Caitanya Mahaprabhu stepped while dancing, the whole earth, with its hills and seas, appeared to tilt. When Caitanya Mahaprabhu danced, He displayed various blissful transcendental changes in His body. Sometimes He appeared as though stunned. Sometimes the hairs of His body stood on end. Sometimes He perspired, cried, trembled and changed color, and sometimes He exhibited symptoms of helplessness, pride, exuberance and humility. When Sri Caitanya Mahaprabhu fell down with a crash while dancing, He would roll on the ground. At such times it appeared that a golden mountain was rolling on the ground. Nityananda Prabhu would stretch out His two hands and try to catch the Lord when He was running here and there. Advaita Acarya would walk behind the Lord and loudly chant "Hari bol! Hari bol!" again and again. Just to check the crowds from coming too near the Lord, they formed three circles. The first circle was guided by Nityananda Prabhu, who is Balarama Himself, the possessor of great strength. All the devotees headed by Kasisvara and Govinda linked hands and formed a second circle around the Lord. Maharaja Prataparudra and his personal assistants formed a third circle around the two inner circles just to check the crowd from coming too near. With his hands on the shoulders of Haricandana, King Prataparudra could see Lord Caitanya Mahaprabhu dancing, and the King felt great ecstasy. While the King beheld the dancing, Srivasa Thakura, standing in front of him, became ecstatic as he saw the dancing of Sri Caitanya Mahaprabhu. Seeing Srivasa Thakura standing before the King, Haricandana touched Srivasa with his hand and requested him to step aside. Absorbed in watching Sri Caitanya Mahaprabhu dance, Srivasa Thakura could not understand why he was being touched and pushed. After he was pushed again and again, he became angry. Srivasa Thakura slapped Haricandana to stop him from pushing him. In turn, this made Haricandana angry. As the angered Haricandana was about to speak to Srivasa Thakura, Prataparudra Maharaja personally stopped him. King Prataparudra said, "You are very fortunate, for you have been graced by the touch of Srivasa Thakura. I am not so fortunate. You should feel obliged to him." Everyone was astonished by the dancing of Caitanya Mahaprabhu, and even Lord Jagannatha became extremely happy to see Him. The car came to a complete standstill and remained immobile while Lord Jagannatha, with unblinking eyes, watched the dancing of Sri Caitanya Mahaprabhu. The goddess of fortune, Subhadra, and Lord Balarama both felt great happiness and ecstasy within Their hearts. Indeed, They were seen smiling at the dancing. When Caitanya Mahaprabhu danced and jumped high, eight wonderful transformations indicative of divine ecstasy were seen in His body. All these symptoms were visible simultaneously. His skin erupted with goose pimples, and the hairs of His body stood on end. His body resembled the simuli [silk cotton tree], all covered with thorns. Indeed, the people became afraid just to see His teeth chatter, and they even thought that His teeth would fall out. Sri Caitanya Mahaprabhu's whole body flowed with perspiration and at the same time oozed blood. He made the sounds "jaja gaga, jaja gaga" in a voice choked with ecstasy. Tears came forcefully from the eyes of the Lord, as if from a syringe, and all the people surrounding Him became wet. Everyone saw the complexion of His body change from white to pink, so that His luster resembled that of the mallika flower. Sometimes He appeared stunned, and sometimes He rolled on the ground. Indeed, sometimes His legs and hands became as hard as dry wood, and He did not move. When the Lord fell on the ground, sometimes His breathing almost stopped. When the devotees saw this, their lives also became very feeble. Water flowed from His eyes and sometimes through His nostrils, and foam fell from His mouth. These flowings appeared to be torrents of nectar descending from the moon. The foam which fell from the mouth of Sri Caitanya Mahaprabhu was taken and drunk by Subhananda because he was very fortunate and expert in relishing the mellow of ecstatic love of Krsna. After performing His devastating dance for some time, Sri Caitanya Mahaprabhu's mind entered into a mood of ecstatic love. After abandoning the dancing, the Lord ordered Svarupa Damodara to sing. Understanding His mind, Svarupa Damodara began to sing as follows. "Now I have gained the Lord of My life, in the absence of whom I was being burned by Cupid and was withering away." When this refrain was loudly sung by Svarupa Damodara, Sri Caitanya Mahaprabhu again began rhythmically dancing in transcendental bliss. 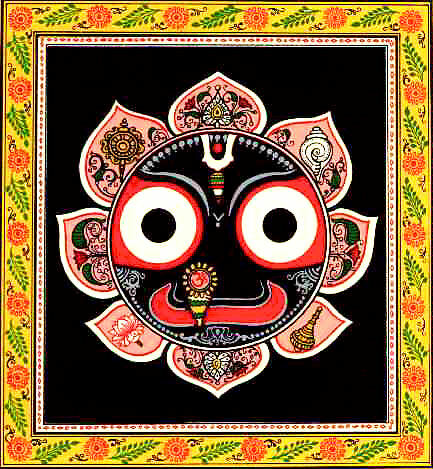 The car of Lord Jagannatha began to move slowly while the son of mother Saci went ahead and danced in front. While dancing and singing, all the devotees in front of Lord Jagannatha kept their eyes on Him. Caitanya Mahaprabhu then went to the end of the procession with the sankirtana performers. His eyes and mind fully absorbed in Lord Jagannatha, Caitanya Mahaprabhu began to play the drama of the song with His two arms. 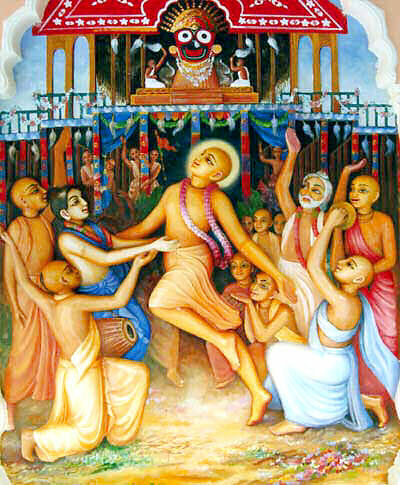 When Caitanya Mahaprabhu was dramatically enacting the song, He would sometimes fall behind in the procession. 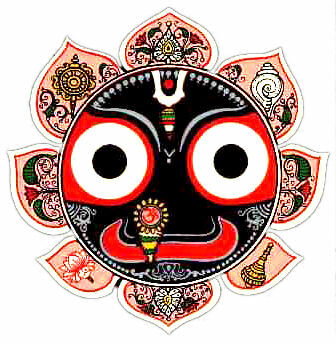 At such times, Lord Jagannatha would come to a standstill. When Caitanya Mahaprabhu again went forward, Lord Jagannatha's car would slowly start again. Thus there was a sort of competition between Caitanya Mahaprabhu and Lord Jagannatha in seeing who would lead, but Caitanya Mahaprabhu was so strong that He made Lord Jagannatha wait in His car. After giving up the company of the gopis in Vrndavana, Sri Krsna, the son of Maharaja Nanda, engaged in His pastimes at Dvaraka. When Krsna went to Kuruksetra with His brother and sister and others from Dvaraka, He again met the inhabitants of Vrndavana. Sri Caitanya Mahaprabhu is radha-bhava-dyuti-suvalita, that is, Krsna Himself assuming the part of Srimati Radharani in order to understand Krsna. Lord Jagannatha-deva is Krsna, and Sri Krsna Caitanya Mahaprabhu is Srimati Radharani. Caitanya Mahaprabhu's leading Lord Jagannatha toward Gundica temple corresponded to Srimati Radharani's leading Krsna toward Vrndavana. Sri Ksetra, Jagannatha Puri, was taken as the kingdom of Dvaraka, the place where Krsna enjoys supreme opulence. However, He was being led by Sri Caitanya Mahaprabhu to Vrndavana, the simple village where all the inhabitants are filled with ecstatic love for Krsna. Sri Ksetra is a place of aisvarya-lila, just as Vrndavana is the place of madhurya-lila. Sri Caitanya Mahaprabhu's following at the rear of the ratha indicated that Lord Jagannatha, Krsna, was forgetting the inhabitants of Vrndavana. Although Krsna neglected the inhabitants of Vrndavana, He could not forget them. Thus in His opulent Ratha-yatra, He was returning to Vrndavana. In the role of Srimati Radharani, Sri Caitanya Mahaprabhu was examining whether the Lord still remembered the inhabitants of Vrndavana. When Caitanya Mahaprabhu fell behind the Ratha car, Jagannatha-deva, Krsna Himself, understood the mind of Srimati Radharani. Therefore, Jagannatha sometimes fell behind the dancing Sri Caitanya Mahaprabhu to indicate to Srimati Radharani that He had not forgotten. 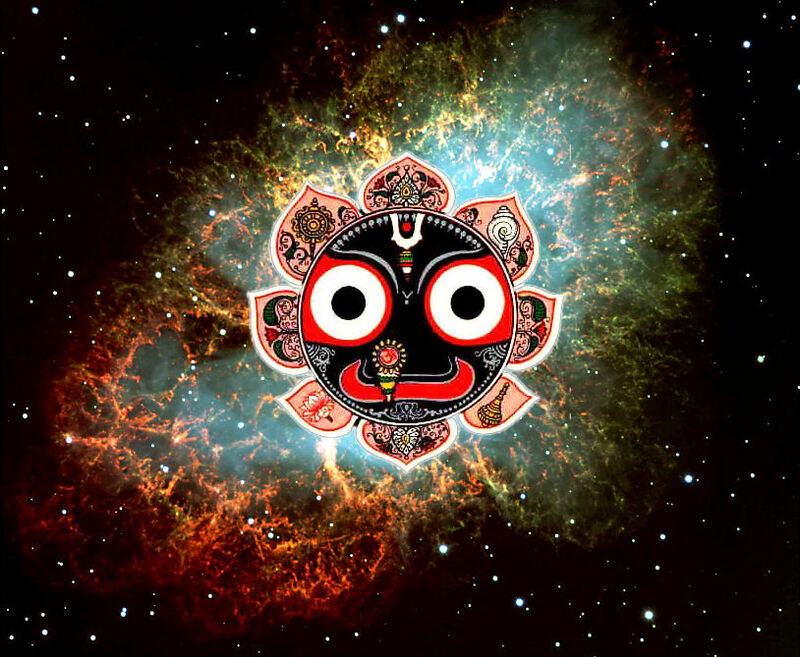 Thus Lord Jagannatha would wait on the ratha for their forward march. In this way Lord Jagannatha agreed that without the ecstasy of Srimati Radharani He could not feel satisfied. While Jagannatha was thus waiting, Gaurasundara, Caitanya Mahaprabhu, in His ecstasy of Srimati Radharani, immediately came forward to Krsna. At such times, Lord Jagannatha would proceed ahead very slowly. These competitive exchanges were all part of the love affair between Krsna and Srimati Radharani. In that competition between Lord Caitanya's ecstasy for Jagannatha and Jagannatha's ecstasy for Srimati Radharani, Caitanya Mahaprabhu emerged successful.